We live in a world where marketing is now measured in experience. With the rise of online marketing and social media platforms, brands have had to step up to ensure potential prospects have a memorable experience. Fortunately, there’s an old form of marketing that, when used properly, can be an invaluable opportunity to get in front of your target audience – outdoor events and exhibitions. At outdoor events and trade shows, you are competing with numerous brands for the same audience. That’s where brand ambassadors come in, a good ambassador is able to increase your leads, brand perception, and expose the brand’s products and image to audiences. Here are five reasons you need a brand ambassador at your next event. If your brand sells a product, it needs staff that are knowledgeable about the products. Brand ambassadors normally work in teams alternating at different places and events, ensuring they get experience and slowly become knowledgeable about the product, pricing, and benefits. Brand ambassadors are able to quickly learn everything that needs to be known about the product. This makes them the perfect candidate if your product requires a demo or significant customer education for a sale. In an age where brands are trying to go viral, it’s important that your potential audience learns quickly about you. Exposure through word-of-mouth is essential yet difficult to achieve, particularly in a time where consumers are constantly being advertised to. Brand ambassadors are highly motivated, friendly, and approachable – making them perfect for face-to-face customer interaction. To gain consumer confidence, you need the right staff that are able to explain what your business does best, exhibit your product’s features through a demo or sample, and effectively embody your brand’s image. This not only improves your brand’s perception towards your audience, but it’s highly effective at generating word-of-mouth opportunities. When promoting your brand at events or outdoors, you need staff that are able to manifest your brand’s values and image. Brand ambassadors can increase brand awareness simply by virtue of wearing company uniforms and costumes. Furthermore, they spend a lot of time learning about your brand and its core values before the event. In fact, brand ambassadors are so good at representing brands that customers can’t tell them apart from your core staff! Brand ambassadors are perfect for product launches and for new marketing campaigns. Since they work in teams in different areas, varied audiences can quickly learn about your brand. experienced in working in these environments, making them perfect for material distribution and lead generation. Here at Promo People, the individuals we provide to represent your brand have been working in the business for years. They are outgoing, approachable, organised and detail-driven. At Promo People, our brand ambassadors are trained marketing professionals. Whatever you need ambassadors for – to spread brand awareness, to create a customer database, to generate leads, or build relationships with potential customers, they can help you. 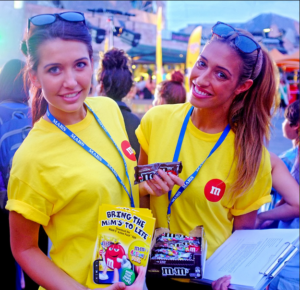 To organise a brand representative at your next event, please get in touch today.